The Pen Museum are taking calligraphy on the road again with our second stop the Museum of the Jewellery Quarter. 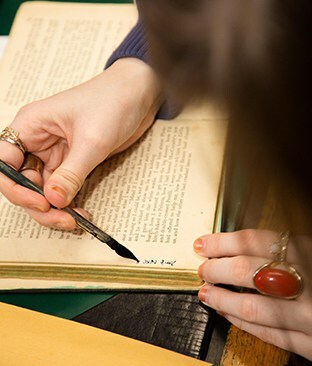 Have a go at calligraphy with expert volunteers from the Pen Museum. In this taster session, you’ll get to know the dip pen, learn some basic strokes and by the end you’ll be able to write your name in uncial script. The sessions are free and we have three slots available on Saturday 18th August so book a place now and get inspired! Time slots are at: 11am, 12.15pm & 1.30 pm. Sessions last 45 minutes.